Sydneyâ€™s climate is temperate, with mostly mild summers and cool winters. There are heat waves in the summer, when temperatures reach 40Â° C (104Â°F) or more. Accompanying the heat is uncomfortably high levels of humidity. Occasionally, very hot, dry winds blow through the city. Luckily, these heat waves last only a few days each summer, and much of the city itself is spared because the ocean breezes moderates the heat. Much of the time, hot days end in cold fronts, during which you can feel the temperature drop. During these times, thunderstorms are common, and after, the evening is crisp and cool. It can become very dry in the summer, so you may see total fire bans (including non-gas barbeques). Australian summer begins in December and ends in February; this is an ideal time to go and hit the beaches. Temperatures usually stay around 25.9Â°C (78.62Â°F). Winter, beginning in June, does not usually get cold. â€œCoolâ€� is a much better way to describe it, as daytime temperatures are rarely below 13Â°C (55.4Â°F). At night, it gets a bit cooler and temperatures at or just below 10Â°C (50Â°F) are the norm. Still, to many from cold, snowy climes, this is warm! 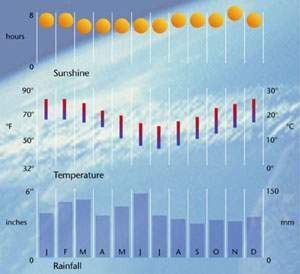 March, April, October, and November are usually very mild, though the chance of rain increases in October and November. Overall, the city receives well over 300 days of sunshine, so anytime is a great time to visit Sydney.